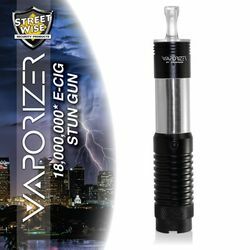 Streetwise Security raises the bar once again with the introduction of the Vaporizer: the World's First Electronic Cigarette Stun Gun. The Streetwise Vaporizer 18,000,000 Stun Flashlight is designed to look like a common Electronic Cigarette or “E-Cig". It is only about 6.25 inches long but packs the power normally found in units twice its size. Even when test fired, the loud bright electrical burst is often enough to stop an attacker and if not a jolt from this unit certainly will! Please note that this is not a real E-Cig, the only “smoking" this unit will do is to the bad guy that gets too close! With this new model protecting yourself is easy….just “VAPE and Escape". 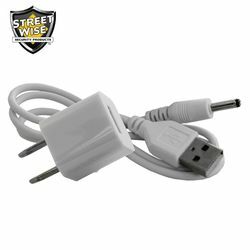 Streetwise Security has been the leading manufacturer of self-defense products for over 25 years and uses advanced technology and top quality materials that can be depended upon to provide you with a lifetime of security and safety. Discrete Protection: Designed to look like an Electronic Cigarette, this model enables you to catch your attacker off guard and gives you the element of surprise that is often needed to safety defend yourself. Easy to Carry and Conceal: At 6.25" long and a diameter slightly larger than a quarter, this unit is easy to carry and conceal. Triple Stun Technology: Most stun guns on the market today have only one or two points of contact. When using this model to defend yourself, the Triple Stun Technology (TST) allows an electrical charge to emanate between three separate points on the top of the stun gun (two sides and the middle). Note: when test firing the electric current will only be visible in the center but the sides will also shock an assailant when you make contact with them. This creates a larger stun radius, allowing you to easily defend yourself. Shock Proof Exterior: Military Grade aluminum alloy protects the unit from damage so it can always be ready to protect you. Blinding 1 Watt LED Light: Not only will the flashlight safely illuminate the entire area at night, but it can also help to protect you. When shined in the eyes of an attacker, the ultra-bright light can have a temporary blinding effect making it easy for you to immobilize them with the stun. Safety Feature: In order to prevent accidental discharge a safety switch is discreetly located at the end of the unit which can only be accessed by unscrewing the mouthpiece. Rechargeable: The included USB cord allows you to charge the Vaporizer using your computer or home outlet using the standard wall block (included). Lifetime Warranty: This unit is made of the highest quality components and comes with a lifetime warranty. *Actual Voltage output is difficult to measure and verify, but this unit compares to other brands that claim to be 18,000,000 or more volts.